Another masterpiece from Steven (GEmVG). I was scapegoat for this run. 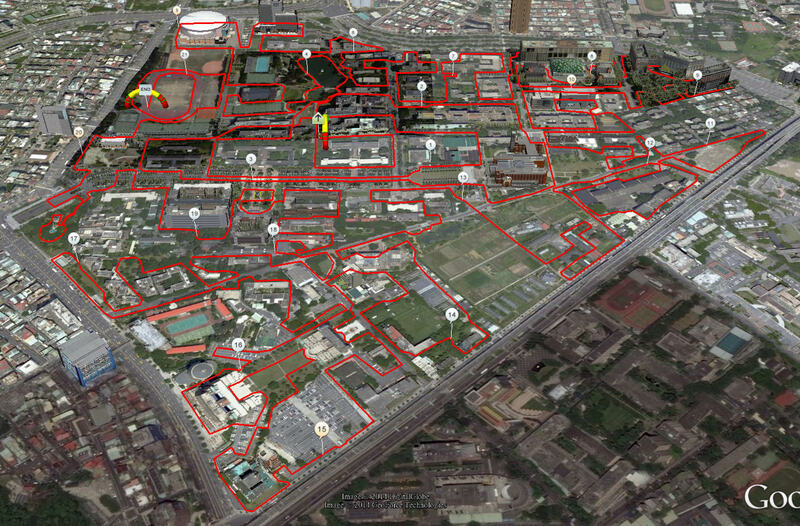 Eulerian path, half marathon, NTU maze, in National Taiwan University campus. The path does not cross itself and it was crazy to run it all. You can remember the amazing Google Earth tour for AA 50km in Shimen, and Steven asked me if I interest test Eulerian path in National Taiwan University campus. I say YES, even known will be quite chalenge It is just flat half marathon distance, but with hundreds turns. I run it few days before my race in Kinabalu as relax course, run slowly, because run faster was impossible. I used my gps watch GlobalSat GH-625XT , I separated the course to three segments (one up to 200 turns) and also print out map of it (the map was very usable). I suggest use smartphone, for example with Locus Map Free application, and upload .kmz file NTU 21km in. I started run (close to post office in NTU) at 6:10 and finished (on track in NTU) at 8 am. First half was fun and I even had mood to look around, but later my brain was very tired from controlling the map and gps watch. Amazing on all is that you never cross same path and visit really all part of NTU campus (just no the private houses on east and I add farm fields). I was happy when I run around NTU bell 台大傅鐘 after 18 km. Finished last 400 m in NTU track. DONE. Steven did so much work on Google Earth for NTU (not only on NTU), all the 3D building and objects he created. His wish is made all NTU in 3D, but there are more than hundred buldings. You can visit GEmVG blog and see another amazing Google Earth tours (on the end of post is link, just download every plugins and enjoy) for interesting races, or just fly on tail of blue magpie 藍鵲 above Xindian district. Thank you very much Steven and hope we can cooperate more on some crazy projects. Anybody interested run it? Let comment below.